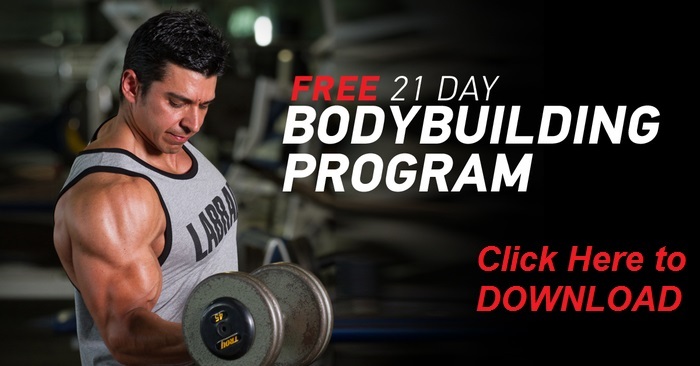 Soreness is a normal part of the recovery process that starts once you finish your bodybuilding workouts. The first type of soreness is the typical mild muscle soreness experienced the day after a good workout. While scientists are still unable to pinpoint the true cause of such soreness, it is generally accepted that it is caused by micro trauma caused at muscle fiber level and by an excess of lactic acid. At either rate, what’s important is the fact that this is good soreness as it is of a mild nature and muscle function is not impaired. It generally lasts a day for advanced athletes and up to 3 days for a beginner. This soreness is a good indicator that you had a good workout the day before as you created the trauma necessary to trigger adaptation (e.g. muscle growth). When you are no longer experiencing this type of soreness then that is an indication that your body has successfully adapted to the training program; something that leads to no gains unless the routine is changed once again. The second type of soreness is delayed onset muscle soreness, better known as DOMS. The term DOMS refers to the deep muscular soreness usually experienced two days after the workout has been done (not the day after). This soreness prevents the full muscular contraction of the muscle. This type of more severe soreness is caused when you either embark an exercise program for the first time or when you train a body part much harder than usual. This pain can last between a couple of days for an advanced well-conditioned athlete or as much as a week for a beginner. If you are being affected by this type of soreness and it is time to workout again, I find that the best idea is not to take the day off, but instead to exercise the body part doing an Active Recovery routine. The Active Recovery Routine that I am referring to here is a routine where all of the loads are reduced by 50% and the sets are not taken to muscular failure. For example, if you are to perform an exercise for ten repetitions, divide the weight that you usually use for that exercise by two and that is the weight that you will use for that day. 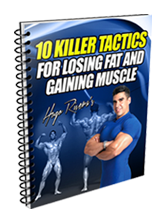 Also, stop executing the exercise even though you will not have reached muscular failure once you get to repetition number ten. The idea of this type of workout is to restore full movement in the muscle and to remove the lactic acid and other waste from it. 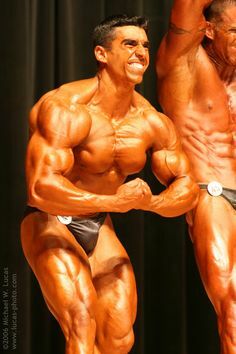 Also, to force high concentrations of blood into the damaged area in order to bring the nutrients needed by the muscle for repair and growth. I have always found that doing this is always more beneficial as by the next day you will not be as sore or stiff anymore as opposed to skipping the workout in the name of recovery and waiting for the pain to subside in a week or so. The third type of soreness is the one caused by injury. This soreness is entirely different in nature from the ones described above as it is usually immobilizing in nature and very sharp. Depending upon the nature of the injury, it may be experienced only when the muscle is moved in a certain way or constantly. Sometimes these injuries become apparent as soon as they happen. Other times the day after. If you become injured, the first thing that you should do is apply the RICE principle (Recovery, Ice, Compression and Elevation). After consulting a doctor, some injuries may allow you to continue training while working around the injury (in other words, finding the exercises that target the injured muscle without involving the range of motion that triggers the pain). Other more serious injuries, like a muscle tear, may involve complete rest of the injured area, and depending on the severity, it may require even surgery. Therefore, when you weight train, please leave the ego somewhere else. Do not bring it into the weight room as it may cause you to get injured and injuries not only can take you out of the gym for a while, but they always seem to haunt you long after you think that you have fully recovered. So needless to say, the best way to prevent this type of soreness is by cycling your exercise parameters and by constantly practicing good form. While this should be obvious, a lot of people miss the boat on this one. 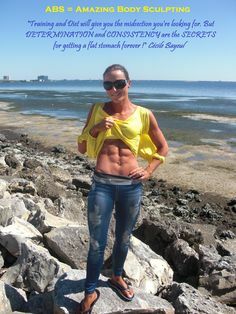 If you do not take the proper amount of carbohydrates (1-2 grams per pound of body weight depending on how fast your metabolism is), 1 gram of protein per pound of body weight and 20% of your total calories from good fats, your body will not have all of the nutrients that it needs in order to recover and grow (regardless of what supplements you are taking). While this does not look fancy, muscle is over 66% water. Therefore it is of utmost importance that you drink your water. You need your body weight x 0.66 in ounces of water on a daily basis in order to function properly. So if you weigh 200-lbs then you need 132 ounces of water per day. Less water than that and you impair your ability to flush out toxins and thus your recovery will be adversely affected. Believe it or not, three to four 30 minute sessions of cardiovascular exercise a week will actually help you speed up recovery since the extra oxygen and circulation helps to flush out toxins and lactic acid out of the system. So do not neglect your cardio. Alternating cold and hot showers (30 seconds of cold water followed by 1 minute of hot water) is a great method to help flush out toxins and lactic acid. The cold water creates vasoconstriction while the hot water creates vasodillation. You can use this simple method after a hard workout. Typically, I like to do 3-5 rounds of cold and hot. Massage can help with lymph movement (a fluid that helps to remove waste from body tissues), which combined with blood helps to supply oxygen and nutrients while helping to rid the body from wastes and toxins. While ideally, the higher the frequency of training, the more often one should get a massage, a massage performed once a month will do wonders for your overall recovery. There is an incredible amount of research that shows certain enzymes are not only good for digestion, but they are also good for anti-inflammation and recovery. I did not really believe this until I started using an enzymatic formula that has helped to reduce the soreness and inflammation that happens after the workouts with great results. 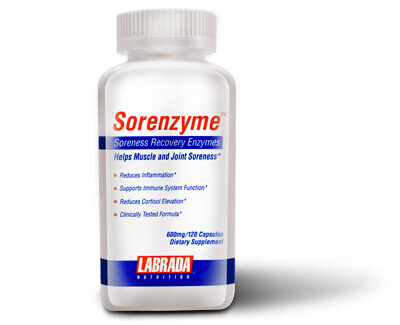 The formula’s name is Sorenzymes, and it is composed of many enzymes that have healing properties and that reduce inflammation. At first, I really did not understand how enzymes can help to recover faster but Lee Labrada set me straight on this. Lee told me that this formula is composed of enzymes that work on a systemic level and address the issue of DOMS. He said: “One of the things that we have been finding from our research is that judicious use of enzymes can actually reduce the inflammation associated with DOMS, which increases recovery and therefore increase muscle growth – it can almost double it. It’s tremendous”. 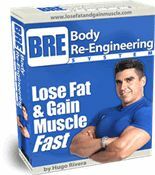 I must say that after I tried the formula, I was not disappointed and thus became a believer in enzyme supplementation. Just 4 capsules taken on an empty stomach after training do the trick for me. Glutamine is the most abundant amino acid in muscle cells. It is released from the muscle during times of stress (such as hard weight training workouts) and dieting. This amino acid not only has been shown to be a great anti-catabolic agent (protects the muscle from the catabolic activities of the hormone cortisol), to be a contributor to muscle cell volume, and to have immune system enhancing properties. For more information on glutamine please take a look at my article on Glutamine Basics. EFA supplementation has been shown to have anti-inflammatory properties (amongst many other good properties). Take at least 14 grams per every 100-lbs of bodyweight. Good sources of EFAs are Fish Oils, Flax Seed Oil, and EFA Lean Gold. Creatine has been shown over and over again to help improve not only in between set recovery but also recovery after a workout as well. Half a teaspoon (2.5 grams) before and after your workout will upgrade your recovery capabilities. 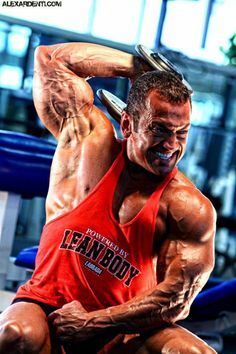 For more information on creatine please take a look at my article on Creatine Basics. If you don’t get enough sleep your cortisol levels will go through the roof, recovery will be impaired, and your probability of getting injured and/or sick will increase. It is of utmost importance that one gets as much sleep as possible with 8 hours being optimal. For more information on the importance of sleep please take a look at my article on The Maladies Caused by Sleep Deprivation. Now you have a few tricks up your sleeve in order to deal with soreness, start implementing these immediately so that you can go to the gym and train super hard!